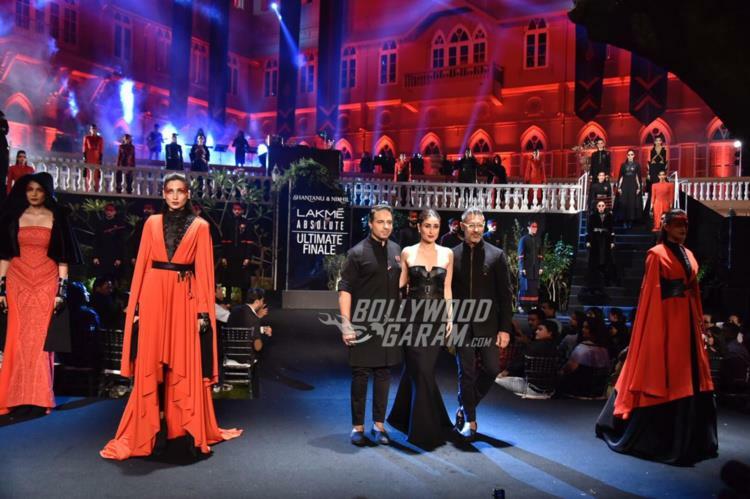 The Lakme Fashion Week 2019 concluded on February 2, 2019. Kareena Kapoor has always been the best muse for her designers and this time it was designers Shantanu and Nikhil who turned Kareena in to a showstopper for their collection at the grand finale. The Veere Di Wedding actress stunned in a black shimmery off-shoulder gown which had a daring thigh high slit. Kareena post her maternity phase has become a busy actress and did well with her film Veere Di Wedding which also starred Sonam Kapoor, Swara Bhaskar and Shikha Talsania. The actress is now busy with some of her upcoming projects including Good News which will also star Akshay Kumar, Diljit Dosanjh and Kiara Advani. Kareena has also signed for the upcoming flick Takht which is a multi-starrer film produced by Karan Johar. The actress is also busy hosting a new radio show known as Ishq FM. Kareena has managed to make a mark in the industry with her performance in films and also with her fashion sense.